A 4 a.m. shift would be tough to get to for just about anyone, but if you worked several miles away from your job and didn’t have a car, such a call time would be darn near impossible. But not for Trenton Lewis. The young single dad started working at a UPS facility in Little Rock, Arkansas last year, and he pretty much always showed up on time for his 4 a.m. shift — not because he had a ride but because he relied on his feet to get him there. In an effort to provide for his 14-month-old daughter Karmen, Lewis would get up in the middle of the night — hours before his workday technically began — in order to ensure he got there on time. All totaled, he would walk 11 miles to and from the Little Rock facility each day. He largely kept his circumstances to himself, but one day a coworker found out about Lewis’ situation. As CNN reported, Patricia “Mama Pat” Bryant is like a “second mother” to Lewis, and she and her husband Kenneth have worked at UPS for decades. When she discovered Lewis’ plight, she approached her husband about doing something to help the young man. The Bryants quietly spread the word about Lewis and donations started pouring in. UPS truck drivers and staff members who had no reason to interact with or even meet the young man felt compelled to give, and soon they had raised some $2,000. According to CBS News, they found a used 2006 Saturn Ion sedan, and Kenneth fixed a few nicks and scratches before hatching a plan to surprise Lewis with his new set of wheels. They decided to organize an early morning meeting under the guise it was for their union. Everyone was in on the real reason for the gathering — except Lewis. As they all stood in a dirt lot, Kenneth began to explain why they were actually there. The moment was captured on video and shared on Facebook. As the camera panned to Lewis, it was clear he had been completely in the dark about what was being done on his behalf. 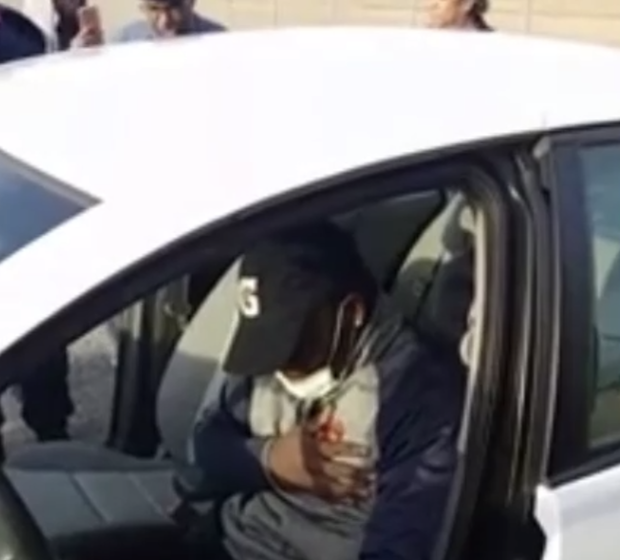 While the car appeared to be filled with gas, those in attendance started giving Lewis a few dollars for gas money, which brought the young man to tears. He said his first stop in his new wheels will be taking his daughter out for a bite to eat, and Kenneth reminded everyone that this an example of the power of good. “Young people [should] know that sometimes if you hang around good people, good things happen,” he concluded.